For the last movie of my “dance” sequence, I’m returning to the Kinetoscope period of Edison Studios, for a movie that was shot on the same day as “Annie Oakley.” Here, we have a group of Sioux men in ostensibly traditional dress, performing a dance in the cramped confines of the “Black Maria” studio, with drummers visible behind them on the stage. 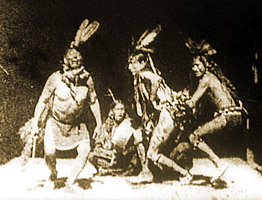 It is very similar to the previously-reviewed “Sioux Ghost Dance,” although in this case history has recorded the names of the performers: Hair Coat, Parts His Hair, and Last Horse. All of them were performers for Buffalo Bill Cody’s Wild West Show, so it’s possible that these authentic-sounding names were actually adopted for stage performances. In that sense, of course this is a movie that exploits Native Americans and the fascination of European Americans with them at the time, and these movies were among the first filmed examples of this, although it would soon become an industry in its own right.